Media Busters: Is North Korea Building a Ballistic Missile Submarine? A recent article in Yonhap citing unnamed ROK Ministry of Defense sources as well as articles in 38 North came to the conclusion that North Korea has built a submarine capable of carrying and launching ballistic missiles that may be operational in 1-2 years. This article has received widespread international attention. While we do not take responsibility for what unnamed sources in the Ministry of Defense have told Yonhap and the veracity of their claims, we do take responsibility for analysis that appears on our website. Figure 1. 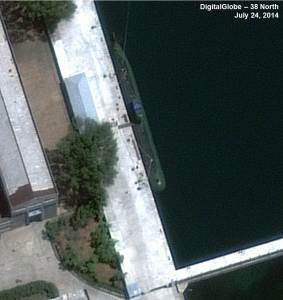 A close-up view of the newly identified Sinpo 67-meter class submarine, July 24, 2014. First, the new class of submarine we identified at the Sinpo naval shipyard is not a Cold War-era GOLF II-class Soviet ballistic missile submarine. Our analysis is that the submarine is significantly smaller and bears a close resemblance to the former Yugoslav SAVA and HEROJ-class patrol submarines, neither of which carried ballistic missiles. Second, based on the limited quality (e.g., 50-cm and 70-cm resolution) and quantity of commercial satellite imagery available to us we have not identified any hatches, missile launch tubes or other indications that this new class of submarine is configured for the vertical launch of ballistic missiles. However, due to the strategic significance and strong public interest in such a development we are working with our commercial satellite imagery partners to collect high-resolution (e.g., 40-cm and 30-cm resolution) imagery upon which to conduct further analysis. Third, in conducting a review of available commercial satellite imagery of North Korea’s submarine shipyards and bases since 2010 we did not identify a GOLF II-class Soviet ballistic missile submarine or any other submarine configured to carry and launch ballistic missiles. We would presume that government intelligence agencies have more information than 38 North. However, given the source of the Yonhap article—unnamed officials in the Defense Ministry—as well as the absence of any other open source information—we would prefer to keep an open mind on this issue. Fourth, 38 North did identify a newly constructed test stand at the Sinpo naval shipyard that could be used to test a vertical launch tube system that could be used to launch ballistic missiles. This facility began construction in 2013 and appears to have been completed by April 2014. How often it has been used since then and how far the DPRK may have progressed in an effort to develop a submarine launching system and associated ballistic missiles remains unclear based on our limited information.